Now that the weather is starting its annual cooldown, grab your camera and hit the trails. With these tried and true photography tips, you’ll be shooting images that will make your out-of-town friends rife with envy that you live in such a breathtakingly scenic place. 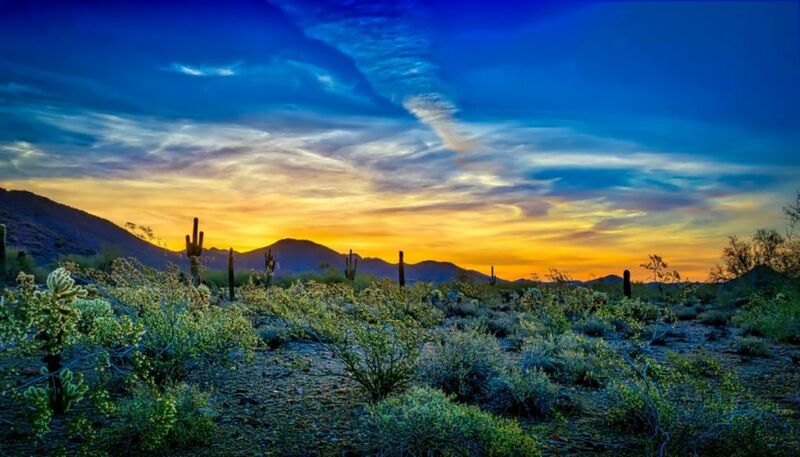 The Golden Hours – The Sonoran Desert appears dramatically different depending on the time of day. Midday light can give a flat, harsh look to the topography and plant life. However, capturing images just after sunrise, late afternoon and just before sunset will give your photos a richness and depth of hue that truly shows the diversity, color and beauty of the desert. Adverse Weather – We’re all here for the sunshine, right? Yet sometimes the most intriguing photos of the desert landscape are created when the weather is less than ideal. Landscapes evoke a different mood when tumultuous clouds hang over head and rain-soaked desert floors offer a new perspective on images of plants and boulders. Go Grand and Small – Grab your wide-angle lens to capture the entire gorgeous vista in front of you. With such vast, dramatic scenery, use people or other familiar objects to give the viewer a sense of scale and to demonstrate how majestic the scene is. Conversely, seek out a wide range of scenes such as tiny plants and flowers or the intricacy of a bird’s nest to add diversity to your portfolio. Compose Your Shot – As you shoot, include a strong point of interest. The eye needs a place to rest within the photo, so using a mountain, a stately saguaro or large boulder outcropping, for example, gives the image a visual anchor. Placing your point of interest off-center makes your photo more interesting when you use the “rule of thirds” both horizontally and vertically. Including an interesting object in the foreground such as a clump of cactus flowers or a rusty gate will give depth to your photo as well. Lastly, use lines to lead your viewer’s eyes to your point of interest. You’ll find angles, such as a trail, a mountain slope, or a shape of a cloud in your view that you can strategically position within the frame.